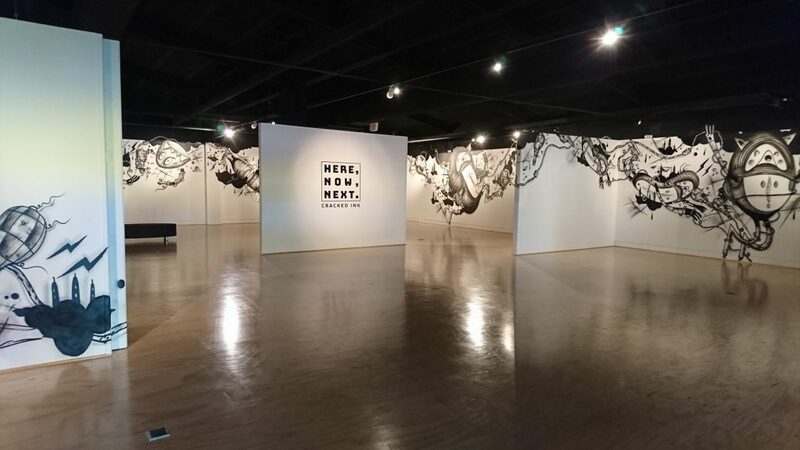 Whangarei Art Museum is pleased to present, Here, now, next: Cracked Ink. 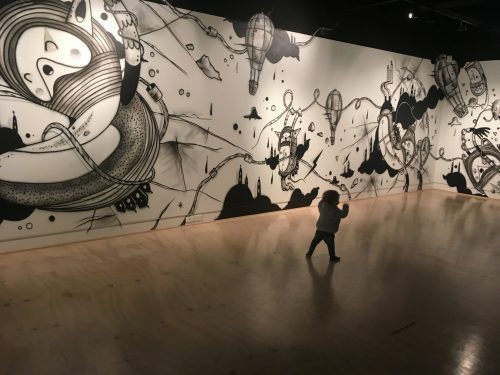 a large-scale mural installation wrapping the walls of the Younghusband gallery. What starts with a simple line, extends and evolves until the once-blank wall is transformed into a world of its own. Eventually, this temporary canvas will be wiped clean, restored to a mundane white wall, so the process can begin again. It’s the nature of a gallery and is reflected in the street, here, now, next. Also accompanying the mural is a 360° timelapse for visitors to experience the process as well as hear from the artist as though he’s with you in the gallery. Don’t forget to bring your smartphone to view the timelapse with our VR headsets! 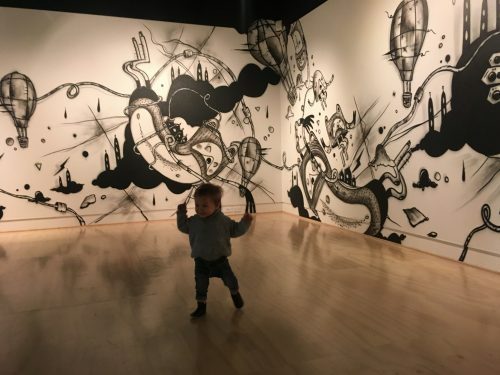 Originally from the UK, the artist, who goes by the name ‘Cracked Ink’ has been involved in both the street art and gallery scenes in New Zealand for the last decade. Born in the streets of New York in the late 1960’s, the Graffiti and Street art movement is one of the most enduring movements in the history of art. It has continued to evolve dramatically, with its scale of importance to contemporary visual culture still clearly on the rise. The level of talent, skill and execution has elevated the oversized mural in our collective consciousness, with the installation processes often as interesting as the works themselves. What starts with a simple line, extends and evolves until the once-blank wall is transformed into a world of its own. Eventually, this temporary canvas will be wiped clean, restored to a mundane white wall, so the process can begin again; here, now, next. Cracked Ink’s compositions explore attitude and expression, with a quirky character based aesthetic that is strikingly monochromatic – a nod to his roots in Graphic Design. Conceptualised first on paper, the art work takes its final form organically on the wall, without a preliminary sketch and leaving no room for error. The result is bold and dynamic, easily engaging the audience. To accompany this exhibition, a 360° virtual time-lapse of the art work has been captured. Visitors can watch the creation unfold on the gallery walls while within the space, adding another dimension of experience.